ArCADia 10 is a computer-aided design (CAD) software that supports 2D and 3D projects, with functionalities and data saving format (DWG) that are akin to the tried and tested AutoCAD program. Among its similarities with AutoCAD include a very intuitive software interface, the ability work in layers, Explorer feature that resembles that of the Design Center, and Cartesian and polar coordinates to name some. ArCADia 10 allows users to compare designs that are made using the ArCADia BIM system and identify even the tiniest difference between the designs. ArCADia 10 is equipped with all the features and tools of a modern CAD software such as merging documents, project manager tree, 2D and 3D views, elements, walls, columns, and more. ArCADia 10 closely resembles the popular and widely used AutoCAD software and this is a good thing. Many designers in the construction and engineering industry have worked with AutoCAD on numerous projects and switching to another software can be a drag. With ArCADia 10, the transition is smooth and the learning curve is short as users don’t have to undergo an entirely new experience or an extensive training process. ArCADia 10 provides them with a familiar environment that simplifies and speeds up the adjustment and utilization of the software. ArCADia 10 is built for the consummate professionals in the engineering and construction industries. The software comes with different modules, with each module built with specific features for specific user types. Whatever the role is, be it designer, architect, engineer, draftsman, or installer, ArCADia 10 has a module with the feature set the user needs and expects. ArCADia 10 allows for the creation of an almost complete design in one environment, without having to import and export from other programs. What Problems Will ArCADia 10 Solve? 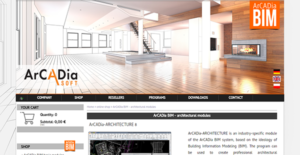 If you are interested in ArCADia 10 it may also be sensible to analyze other subcategories of Best CAD Software gathered in our database of B2B software reviews. It is important to note that almost no app in the CAD Software category is an ideal solution that can fulfill all the goals of various company types, sizes and industries. It may be a good idea to read a few ArCADia 10 reviews first as certain solutions can excel just in a very small group of applications or be created with a very specific type of industry in mind. Others can work with an idea of being easy and intuitive and as a result lack complicated features needed by more experienced users. You can also come across apps that support a large group of customers and provide a powerful feature toolbox, however this frequently comes at a higher cost of such a service. Ensure you're aware of your requirements so that you select a service that has all the elements you look for. How Much Does ArCADia 10 Cost? ArCADia 10 is offered at an enterprise pricing rate of €426. Contact ArCADia Soft for more product information. We realize that when you make a decision to buy CAD Software it’s important not only to see how experts evaluate it in their reviews, but also to find out if the real people and companies that buy it are actually satisfied with the product. That’s why we’ve created our behavior-based Customer Satisfaction Algorithm™ that gathers customer reviews, comments and ArCADia 10 reviews across a wide range of social media sites. The data is then presented in an easy to digest form showing how many people had positive and negative experience with ArCADia 10. With that information at hand you should be equipped to make an informed buying decision that you won’t regret. What are ArCADia 10 pricing details? What integrations are available for ArCADia 10? Affordability, suitable for micro, SME and large industry users. Also, requiring a light specs PC; which is a great bonus.